« A tough old bird! We used to have mint leaves in our backyard when I was a youngen. So I know the simplicity and super taste you speak of! Best mint teas I ever had. I do like infusions especially if they include ginger. I also drink a lot of lime juice with a spoonful of honey and warm water. You have to try basil water. Break up a few leaves of basil and put them in a jug of water. Put it in the fridge. Drink it in a couple of hours. So refreshing in the warm weather. An elegant way to make tea. I use a lot more herb. I’ll try it your way and look up your links too, it’s something I’m interested in. I would include my photo, since I now have one in my computer but I’ll have to figure out how to do it. I like your blog; it’s cheerful and up beat. Thanks. I’m going to try ginger tea for my terribly soar throat. I have some wonderfully tender fresh ginger grown in the Virginia countryside, which I have kept in a jar of sherry. That’s a great trick for keeping ginger in your frig… Usually you peel it, then put it in the jar with sherry and it keeps forever, but this ginger is so fresh, there is no peel! I made delicious Ginger Margaritas with my ginger this summer for my 85-year-old Aunt Betse… She had the recipe for ginger syrup… I put some in the freezer in ice cube trays. Yummy! Excellent tea, Robin. 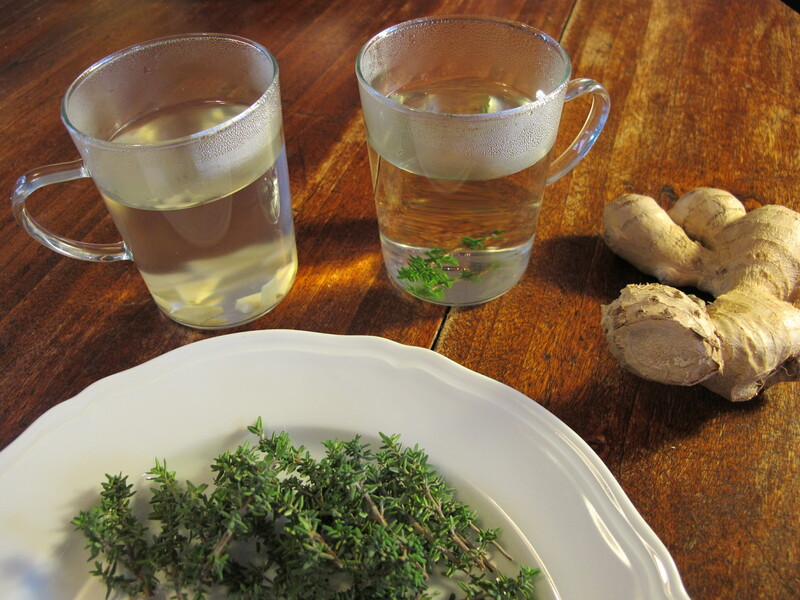 Ginger tea is also good for nausea or a queasy stomach. It works! OOOPS! I just read your links! Sorry to be redundant. Robin, you had the theraputic aspects of ginger already covered! Wonderful! I’m so glad the ginger helped. It really helped my cough. on January 15, 2012 at 6:29 pm | Reply John L.
What a great ginger taste, perfect for the January blahs! + late but hearty good wishes on your birthday!